Next in the series on Lawless Craft Jerky is this Sweet Sriracha beef jerky. See my previous reviews of their other flavors. The company was created by a licensed attorney named Matthew Tolnick of Santa Monica, CA. He started making jerky during his days in college when he and his fraternity boys needed sustenance through long evenings of studying. After a successful Kickstarter campaign, Tolnick stepped up his game, producing jerky in a USDA inspected facility and marketing his product full time. This Sweet Sriracha is described by Tolnick as being inspired by the famous Sriracha Sauce, with all of its garlic peppery goodness, but sweetened up some. The first thing I taste from the surface of these pieces is a sweetness, followed by a light bit of ginger. Some saltiness comes in later, and a light burn starts up. The chewing flavor starts with the flavor of Sriracha Sauce with a noticeable garlic and chile pepper flavor. I'm also picking up a light tanginess, perhaps from the vinegar, and very faint notes of citrus. For being marketed as a "Sweet Sriracha" beef jerky, it seems to hold up well. I do get a flavor that resembles a thai chili sauce, very much like Sriracha Sauce. There's plenty of that garlic, chile pepper, and vinegar flavor much like from the sauce made by Huy Fong Foods (the one with the rooster on the bottle). 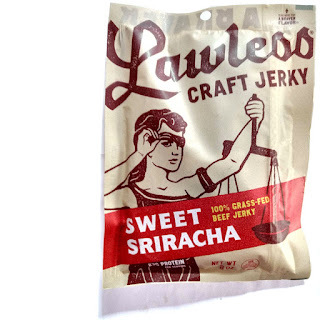 The jerky even has the unmistakable aroma of the Sriracha Sauce. And that's largely the flavor that defines this jerky. Though I can pick up some addition flavors, namely ginger, but also a lighter bit of citrus. The level of heat in this is not that high. On my personal heat scale, I'd rank this as "medium" (Level 3 out of 5). I'm only getting a light bit of the natural meat flavors, and mostly towards the end of chewing, when the other flavors wear off. Overall, it's a very tasty combination of Sriracha Sauce, ginger, and citrus, and a light bit of natural meat flavor. These are slices of whole meat, sliced into small strips of about two to three inches in length. This is a dry jerky with a somewhat sticky and moist surface feel. The strips have some flexibility, but still stiff enough to require just a little effort into chewing. The chewing texture starts out feeling chewy, with some initial resistance, requiring a bit of labor to break down. It soon takes on a meaty, steak like feel during the chewing, and by the time it renders into a soft mass it feels just like a real piece of meat. I don't see any visible signs of fat or gristle, but I do experience a fair amount of stringiness in the chewing. Otherwise, I found no problematic tissues that I had to remove from my mouth. As for clean eating, my fingers just a light bit of residue, requiring just a light bit of licking and wiping before touching the keyboard. 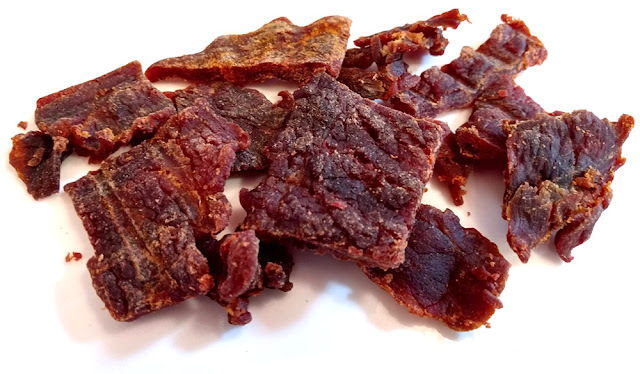 This Sweet Sriracha beef jerky from Lawless Craft Jerky comes off as a very flavorful presentation of Sriracha Sauce, retaining the same great garlic, chile pepper, and vinegar flavor, but also adds in a nice bit of ginger and a touch of citrus. The result opened up my eyes and made me think "wow!" There's also the inherent sweetness in the Sriracha Sauce, but boosted by the pineapple juice, that creates the effect of eating a sweet & spicy jerky. I also liked the level of heat in this, keeping it at moderate so that I could keep feeding my face without having to douse the flames. Even though I couldn't get much of the natural meat flavors from this, I was still able to taste some towards the end. But largely, I really liked the overall flavor of this jerky. My recommended beer pairing, I think a citrus-like wheat beer would do well, try the Leinenkugel Sunset Wheat or the Wailua Wheat from Kona Brewing.